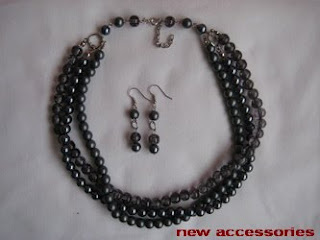 This gray beaded necklace is made with 8mm plastic and 8mm glass beads, 8mm, 12mm jump rings. A todos desejo um Santo e Feliz Natal, com muita saúde, muita paz e muita união entre todos! E faço votos para que 2010 seja um ano de muito sucesso e muitos sonhos realizados! (Desculpem a mensagem não ser personalizada para cada um, mas devido à falta de tempo é a única forma de (tentar) passar por todos os cantinhos que adoro e que tenho tantas saudades de visitar). wow this is a nice post and interesting one..
Looks very elegant. 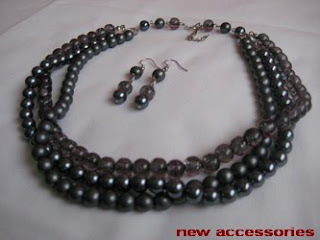 They look like black pearls! They look very nice with a nice pair of earrings. Nice necklace, I think i should buy it for my friend. Is it cost effective. Here you can find very beautiful handmade jewelry, Handmade beaded jewelry including beaded necklaces, beaded earrings, beaded bracelets, beaded rings. Hi to everyone who visit this blog. If you want to see and promo your bead work on my blog, send me an e-mail newbeadedjewelry@gmail.com with articles or photos with description and I will post them on my blog. I am looking for great content to post on my blog.